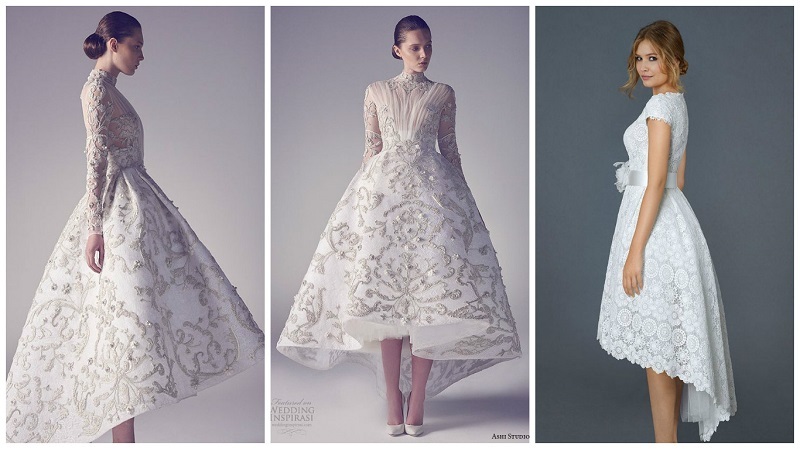 Top Wedding Dress Predictions for The Coming Year! So whether you just decided to tie the knot with the love of your life or are already in the process of wedding planning, you are undoubtedly in the middle of the one of the most exciting and important times of your life. Of course you would want to be up on the latest wedding dress trends. Who wouldn’t? But what about the wedding dress trends that have still not happened yet? If your wedding date is falling somewhere in the coming year, here we provide you with all the sneak peek at the bridal styles that haven’t been on the runway yet. When it comes to the bridal fashion of the coming year, perfect symmetry will be an element of the past. Eclectic designs and enticing abstract will shine and be influential in the bridal gowns. The Mullet wedding gowns are already marking the runways and will be seen to influence bridal fashion as well. Pair the silhouette with an alluring pair of heels and be assured to navigate any venue with much ease, especially outdoors. You’ll get to see flashes of metallic shining all over the runways- from evening gowns to athleisure, accessories, and makeup. And it seems this trend is not going anywhere any time soon. 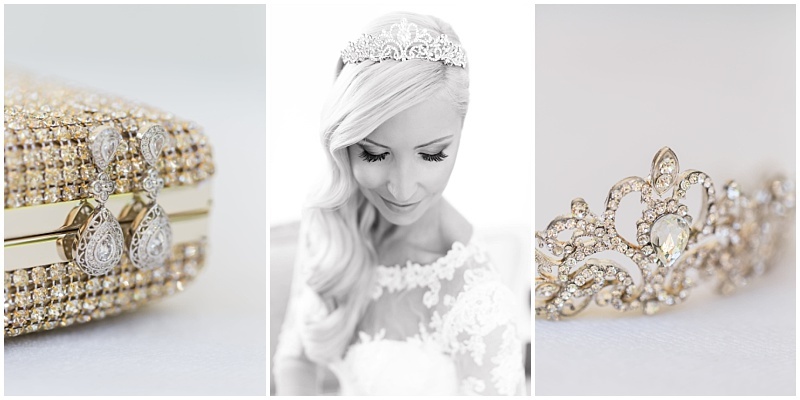 Silver, rose gold, and mixed metals of gold are quite popular in fashion and will help the brides make a style statement in the coming year. One can add more dimension to the outfit by accessorizing with bridal belts, mixed metal jewelry and hair accessories. Once the shoulder-baring gowns make their mark, there would be more lookout for straps. The spaghetti straps are influenced from the 90s and is predicted to stay further. This trend is best for the brides who are looking for more security on top without having to opt for a complete coverage look. For the bridal accessories, conventional materials such as pearls and rhinestones are predicted to accent with more natural components. An avant-garde headpieces and bridal jewelry would be created with the help of traditional materials such as raw opals, elliptic keshi pearls and crystals. The opportunity for personalization will be heightened by this trend. There would be endless possibilities with malleable, hand-wired vines that can be worn as halos or headbands, wrapped around a bun, woven in a braid, or even worn as a bracelet or a necklace. Days when the white or ivory were the only two options that a bride had to choose from are long gone. These days, brides are embracing colored gowns with the desire to be more expressive and unique. If you are more of a conservative person, then tones of champagne or blush are recommended. For fashion-forward brides who are looking to mark a splash, shades of silver, lavender, blue and gold are a promising option. 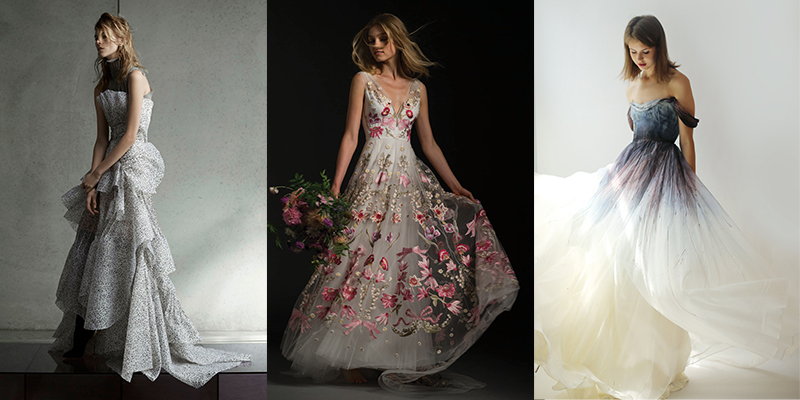 These wedding dress predictions are held by some of the top bridal stylists. Since there is still quite some time left for the Bridal Fashion Week, these are what you should expect to wear for your wedding in the coming year.